PHOENIX – Heather Grimes is a 24-year-old vegan who enjoys painting, making jewelry and playing in a band. She’s also a taxidermist. Grimes isn’t alone in her interest for the art of preserving, posing and mounting dead animals for posterity. 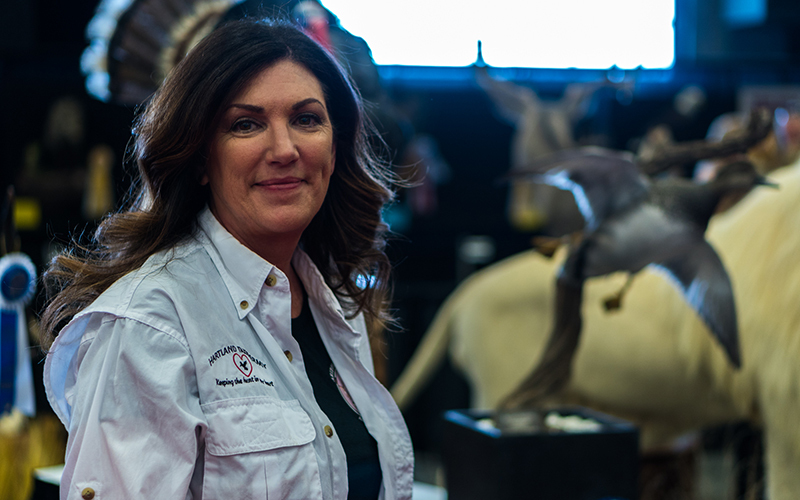 Robert Mead, president of the Arizona Taxidermy Association, said he has seen an increase in women in taxidermy, traditionally a male-dominated industry. 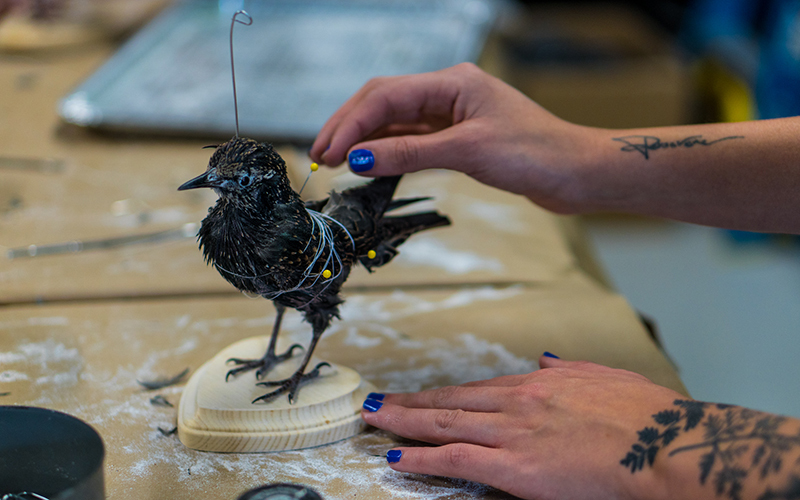 Women taxidermists now are competing in championship shows with their own works of art. Taxidermy is a hobby for some; others make it their business. 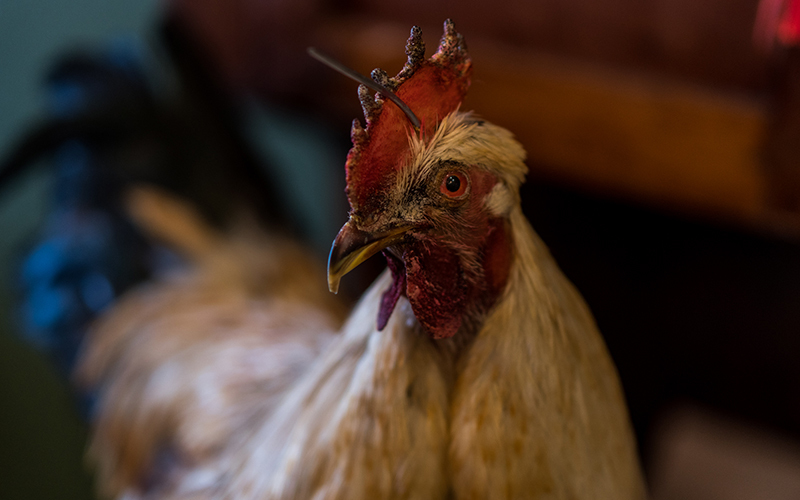 Hartland said taxidermy is not just “an old guy thing anymore.” With their attention to detail, women seem to be better at it than men are, she said, adding that at a competition last year, she heard one of the men had used eyeshadow to add color to his bird mount. “For somebody who wears eyeshadow every day, you’re like, ‘No kidding, I know how this works,’” she said. Using makeup is permitted and taxidermists find creative ways to make their mounts look as natural as possible, including using clear nail polish to make the eyes glossy or fake eyelashes to imitate hair. The process is time-intensive and requires a great deal of practice to do well. 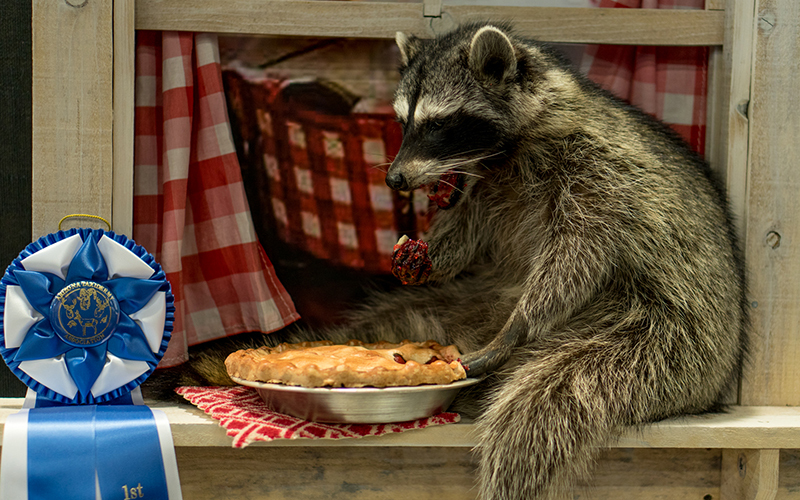 Taxidermists typically preserve and mount animals that were killed by hunters, but others use what they consider more sustainable and ethical sources for their carcasses. Grimes said she does not support trophy hunting and only works with animals that have died naturally from sickness or old age. She focuses primarily on bird taxidermy and gets her specimens from a breeder who sends her animals when they die of natural causes.  Grimes works at Curious Nature, a “fine science and natural history emporium for all things fantastic and strange,” according to their website. 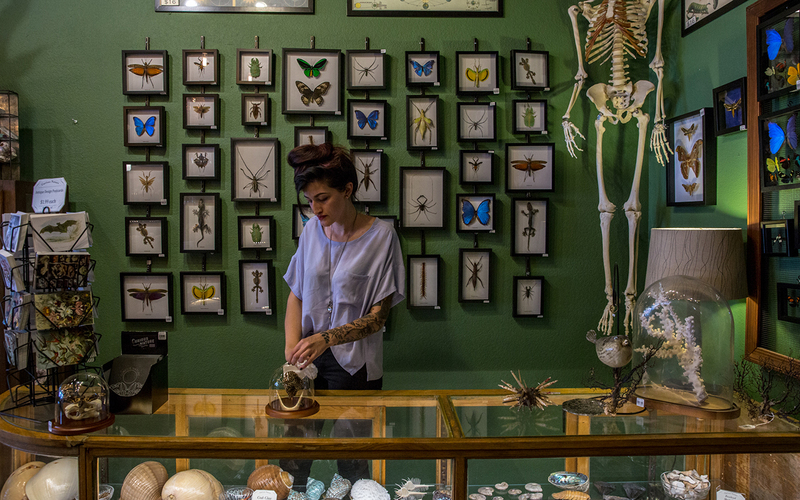 The shop offers their customers everything from taxidermy, skulls and bones and other unique collectibles. The store only sells ethically sourced specimens and vintage taxidermy that is at least 10 years old. The shop also offers taxidermy classes. During a recent session, participants were given all the materials and instruction necessary to make a “jackalope,” a fictional creature from American folklore, which is made by attaching antlers to a rabbit’s head. Of the eight people who took the class, six were young women. “Our parents think we are crazy,” said Averie Elias, 24, as she and her husband, Nicholas, carefully removed all the flesh from the skin of a white rabbit. 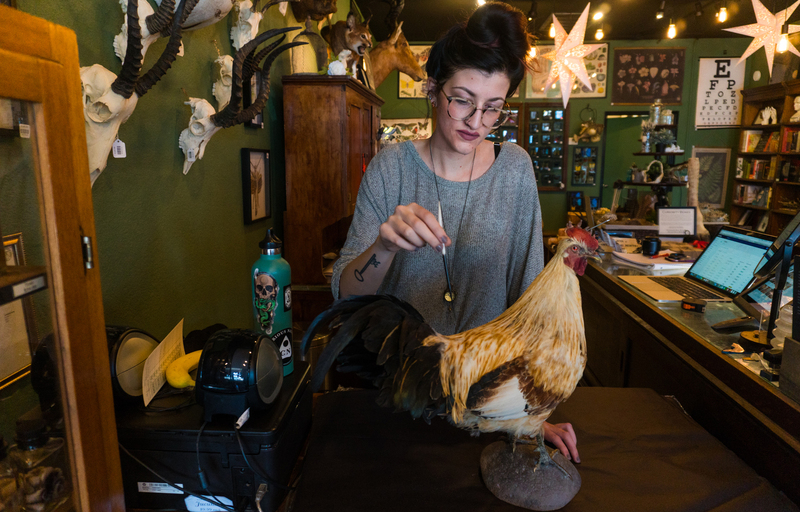 Under the keen supervision of taxidermists Doug and Suzi James, the students learned about the entire process, from skinning the animal to placing it on a wooden plaque. Patience and being able to take constructive criticism are are important when learning taxidermy, Grimes said, and there’s always room for improvement when a mount is finished. “You can’t just like read about it and study it and then do it perfectly. You have to just go and do it. And then if you mess up, then you learn along the way,” Grimes said. Suzi James said she picked up taxidermy after watching her husband do it for years. She was always interested and wanted to see if she could do it. This year, she entered some of her work in the Arizona Taxidermy State Championship for the first time, and three of her pieces took first and second places in the novice division. Grimes said the challenges of taxidermy feel especially worthwhile when she shows people something they might not have seen before. She strives to instill a renewed sense of appreciation for nature.